The newest addition to Husky Liners® lineup is the X-act Contour™ floor liners. Made from a rubberized material that conforms perfectly to your vehicle’s carpeted or vinyl floorboards. The X-act Contour™ floor liners offer a rich texture and soft, flexible feel while offering the superior functionality and protection of our Classic Style™ and WeatherBeater™ floor liners. The Patented Form-Fit Edge™ and raised ribs are designed to help keep damaging spills off your doorsill and carpet, allows for easier entry and exit and keeps your shoes up and out of the mess. The Husky Liners® lifetime warranty against cracking and breaking make these the best, premier floor liners you can buy for your vehicle. Engineered for vehicle owners who demand both superior floor protection and advanced styling for their current model vehicles. Unique ability to work with both vinyl and carpeted flooring. Durable protection with a flexible comfortable soft feel. Textured and contoured finish for a factory look. Uses all existing factory carpet hooks and fasteners. Patented Form-Fit Edge™ gives your floor liner a finished look while keeping damaging spills off your doorsill and carpet. Incorporates raised arcing ribs to help divert fluids, keeping your shoes up and out of the mess. Functional and fashionable raised arching ribs designed to help divert small to large amounts of fluids, keeping your shoes up and out of the mess. Designed using the latest in laser scanning technology to fit the complex surfaces of your specific vehicle’s floorboard. Laser scanning technology guarantees the best fit for complex surfaces of your vehicle’s floorboard. 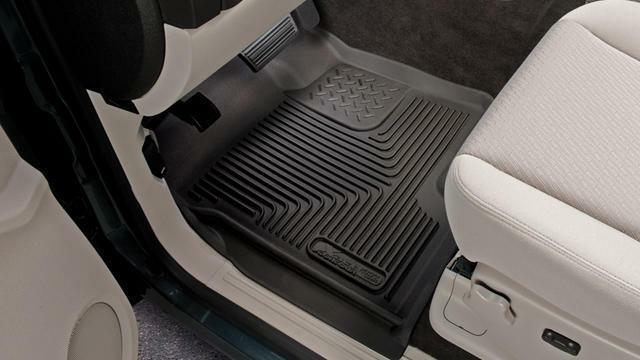 Patented molded in “Nibs” on the back of the Floor Liner to help prevent shifting. Exclusive elastomeric material that withstands most harmful chemicals including oil, gas, and battery acid. Lifetime Guarantee against cracking and breaking. Front & Back liners sold separately.